There was a lot of ducking and diving going on at the TRGG last week, what with it being the wettest few days in Thailand since Noah and his Ark. In fact by the end of the week Pattaya was officially declared a flood disaster zone. Despite all of this, somehow, the TRGG managed to play four golf competitions and none were adversely affected by the weather, quite amazing. Carmen Hurdon & Rungratree Puangsal. Personally, I put it down to us now having two ex-Scousers (gentlemen from Liverpool) in charge as Scousers are world renowned for their ducking and diving skills. That normally refers to ducking the attention of the local police and diving out of doing any work. So avoiding the odd torrential downpour comes as second nature to them. 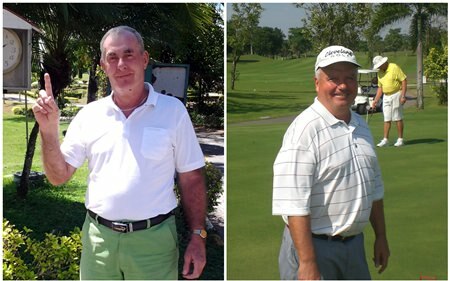 The week got underway on Monday with a trip over to Emerald and the family Hurdon (Graham and Carmen) just carried on where they had left off the previous week in Hua Hin by cleaning up. The champion of Hua Hin, Graham, did the courteous thing and stepped aside today, allowing his wife to take top spot but he retained enough of the competitive instinct to relegate Derek Thororgood into third place after a count back. On Tuesday it was off to play Phoenix (Mountain and Ocean). Under dark threatening skies a close battle developed between Irishman Joe Nagle, returning from a serious back injury, and John O’Donaghue, the giant Aussie bus driver from Newcastle (Aus. that is not Tyne and Wear). Mind you, with a name like O’Donaghue he has got have some Irish in him somewhere. Joe just managed to get the better of John but only after a count back. Carmen Hurdon had to settle for third place on the day. Now two weeks ago I was expressing my surprise at the low scores that won at Burapha and wondered if everyone was protecting their handicap prior to the Hua Hin trip. Well I was obviously right because on Wednesday the winning scores were back up into the stratosphere. Carmen Hurdon rattled up 43 points to take first place and Joe Nagle (bad back and all) stormed home in second place with 40. Even Billy Allan, who finished third, knocked off 37 points. They are a devious lot these golfers. We headed over to Mountain Shadow on Friday and after the previous day’s bad weather we quite expected to be rowing round the course but no, we found it was in good condition. The only real problem was that the returning sun and the sodden ground produced sauna like conditions which certainly had an adverse effect on us old boys and we all struggled over the finish line. Even some of the younger guys admitted it had been hard work and the final scores reflected that. It therefore came as no surprise that it was a local Thai, Rungratree Puangsal, who took the conditions in her stride and finished in first place. She was followed home by Al Marumoto, who I believe hales from Japan, and must have seen it all before. Third place was filled by westerner Billy Allan but he struggled to get to 29 points. Good luck to all you golfers for the coming week and if you would like to play a round of golf with the TRGG, please phone Derek Thorogood on 080 673 3118 or pop into the Ned Kelly Bar in Soi Lengkee and add your name to the weekly lists which are posted on the notice board.